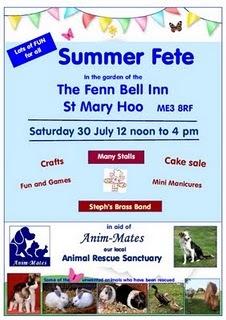 A local animal rescue sanctuary is holding its first Summer Fete this Saturday (30 July) at the Fenn Bell pub in St. Mary Hoo, from 12 noon until 4pm. Supporters of the Anim-Mates animal rescue sanctuary, based in St. Mary Hoo, will be bringing lots of family fun to the pub for the afternoon. All the money raised from this event will go towards the rescue animals’ veterinary fees, food and bedding. If anyone needs any convincing about whether to pop along, take a look at their website – showing some of the animals cared for by Anim-Mates.